Agave potatorum is a species of agave, which is a succulent plant. 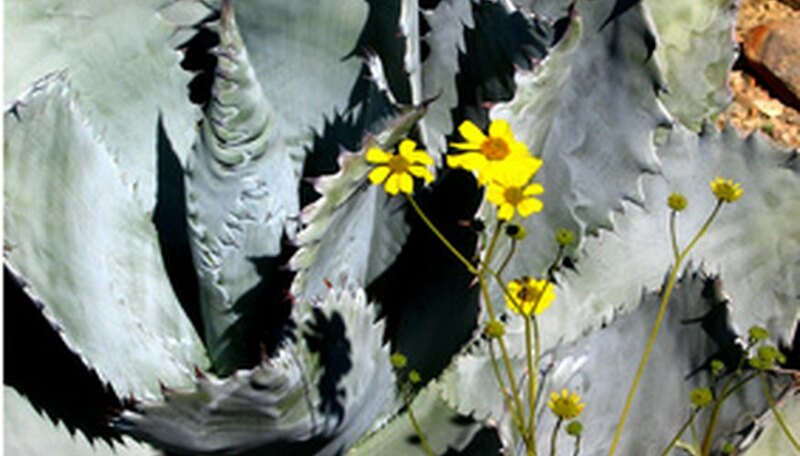 Varieties of the plant include the butterfly agave, which is so named for the shape of its leaves. Agave poratorum will grow to a height of only 1 or 2 feet, and might be even smaller if kept in a pot rather than planted in the ground. The thick leaves are edged with red spikes (which are sometimes called teeth) and grow in a rosette pattern, making this a rather striking plant. The agave potatorum requires only basic care. The agave potatorum is a tropical succulent. It requires consistently warm temperatures and will only grow outside in USDA growing zones 9b to 10. This plant should be exposed to full sunlight, although in very hot areas it can benefit from afternoon shade, which will prevent the leaves from scorching. The agave potatorum will begin to decline when exposed to temperatures below 50 degrees Fahrenheit, although it can withstand brief exposures to cold temperatures without dying. The agave potatorum should be planted in sandy, well-draining soil. Standard potting soils are too moist for this plant, so if planting it in a container use a potting soil that is made specifically for cacti and succulents. Like most succulents, the agave potatorum does not need frequent watering. Water deeply and slowly, using a drip or soaking hose, then let the soil dry out before watering again. In the winter, water only when the leaves start rolling up. They enjoy humid conditions but will grow fine without humidity as well. Still, misting these plants every once in a while will help keep the leaves free of dust. These hardy plants do not need to be fertilized, nor should they be pruned.